No time to cook or go out to buy? Leave it to us! 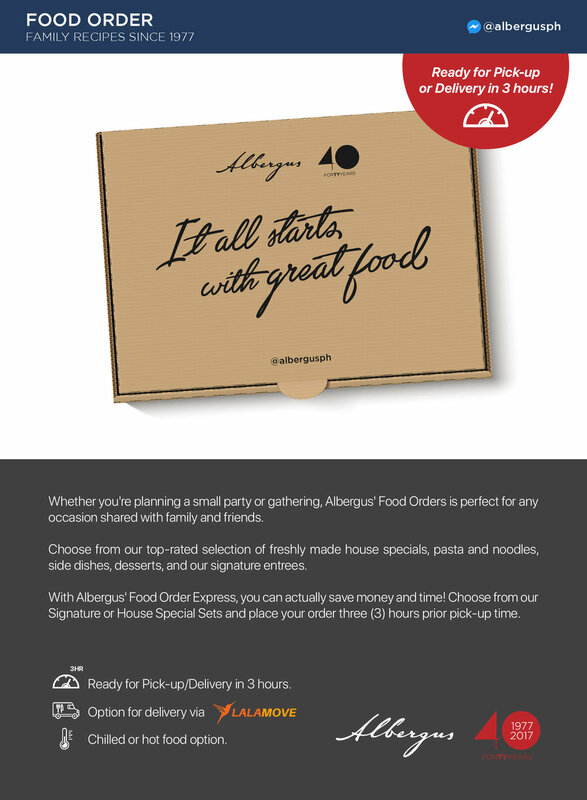 Albergus' Food Order Express is perfect for all occasions: from dinner parties, to house parties and surprise get-togethers! We are your #1 option for premiun food delivery orders in Metro, Manila Philippines. Click here to see our full menu. No time to cook? Leave it to us! Whether you're planning a small party or gathering, Albergus' Food Order is perfect for any occasion shared with family or friends. Choose from our top-rated selection of freshly made side dishes, house specials, pasta and noodles, desserts, and our signature entrees. With Albergus' Food Order Express, you can actually save money and time! Choose from our Signature Bundle or House Special Bundle and place your order three (3) hours prior pick-up time. Check out our menu to see our delectable options and for more details!